Cape Town is known around the world for its stunning scenery, its world-class restaurants and its fascinating cultural landmarks (including Robben Island and District Six). However, what many visitors don't know is that the city is also a convenient jumping-off point for some of the finest game reserves in the Western Cape. If you don't have time to head north to iconic South African reserves like the Kruger or Mkhuze, don't worry - you can go in search of safari animals in Cape Town's backyard. All of the reserves listed in this article are within a few hours' drive of the Mother City. They're also malaria-free, giving them a major benefit over the more famous parks of the far north. Although safari purists may balk at the idea of a reserve that keeps its carnivores in separate enclosures, Buffelsfontein Game Reserve is nevertheless the most convenient option for those with limited time to spare. A 1,600-hectare converted cattle ranch, the park is just an hour's drive from central Cape Town and is home to four of the Big Five (lion, leopard, buffalo and white rhino). Guests will also have the opportunity to spot cheetah, giraffe, zebra and several other iconic antelope species on a half or full guided game drive. The half drive lasts for 1.5 hours, while the full drive takes around three hours and departs at 9:00am or 2:00pm. If you book an afternoon full drive on any day except Sunday, you'll also get to see the park's carnivores being fed. For a totally different safari experience, consider booking a mountain bike safari instead. If you do have time to extend your stay, there are a variety of accommodation options to choose from, from bush camps and self-catering chalets for budget travelers to more luxurious four-sleeper cottages. There's a restaurant, swimming pool and bar on-site. ​Located two hours' drive northeast of Cape Town, Aquila Private Game Reserve is a 4-star park offering half-day, full-day and overnight safari options. The 10,000-hectare conservancy is home to the Big Five - including rhino, elephant, lion, leopard and buffalo. All five of these species have been reintroduced to the Western Cape after being driven to the brink of extinction by the big game hunters of the past. The park is also home to the Aquila Animal Rescue and Conservation Centre, which provides a sanctuary for rescued safari animals that are no longer able to survive in the wild. If the idea of a traditional safari vehicle is a little too tame, consider booking a horse-riding or quad bike safari instead. Although the park is close enough for a day trip from Cape Town, overnight accommodations include a luxury lodge and several exquisite chalets. The chalets offer indoor fireplaces and outdoor showers, allowing you to fully appreciate the magic of life in the bush. Other useful amenities include a bar, a restaurant, an infinity pool and a spa. Half an hour beyond Aquila Private Game Reserve lies Inverdoorn Game Reserve, another 10,000-hectare protected area in the Klein Karoo. Inverdoorn achieved Big Five status in 2012 with the introduction of a herd of elephant. 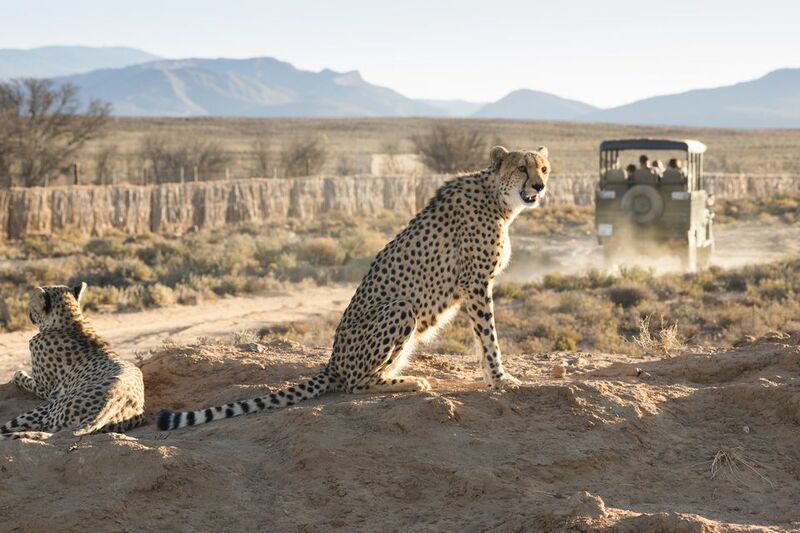 It is also home to non-profit organization Western Cape Cheetah Conservation and visitors are given the opportunity to see these magnificent predators up close. Some of the cheetahs have become acclimatized to human contact and can even be petted (under the strict supervision of their handlers, of course). The park's Iziba Safari Lodge offers a choice of 4-star and 5-star accommodation options for those wishing to extend their stay. There's a tented camp and a series of well-appointed chalets, while the multiple-room guest houses are perfect for families or friends traveling together. For the last word in luxury, opt for a night in the exquisite Ambassador Suite. Overnight guests are invited to join a walking safari at sunrise, when the animals of the reserve are at their most active. From Cape Town, you can drive to Sanbona Wildlife Reserve in just over three hours. Nestled at the foot of the Warmwaterberg Mountains, the reserve is a Klein Karoo paradise known for its indigenous wildlife and its ancient rock art. Measuring some 54,000 hectares, it is also made special by its vast, sprawling landscapes. You'll find the Big Five here, as well as cheetah and smaller native mammals including the rare riverine rabbit. The wide range of activities on offer include birdwatching, nature walks, rock art tours and stargazing. Boat safaris on Bellair Dam offer a different game-viewing perspective. Since game drives take place at sunrise and sunset, most visitors to Sanbona Wildlife Reserve opt to stay overnight. There are three luxury lodges to choose from, including a tented lodge with spa baths, private decks and a fine-dining restaurant. If you want to experience Africa at its most authentic, consider a walking safari with a stay at the back-to-basics Explorer Camp. A kids' program and a dedicated family lodge make this the ideal choice for those traveling with children. When you've ticked the Big Five off your bucket-list, consider taking a two-hour drive south of Cape Town to coastal Grootbos Private Nature Reserve. Located at the meeting point of the Atlantic and Indian oceans, the reserve is the ultimate destination for spotting the Marine Big Five - namely, great white sharks, southern right whales, bottlenose dolphins, African penguins and Cape fur seals. The lodge offers coastal safaris in association with Dyer Island Cruises. Cage diving with great white sharks, whale-watching tours, horse-riding, nature walks and botanical safaris are also offered. The reserve, which measures 2,500 hectares, is home to almost 800 different plant species - 100 of which are endangered. Its protected milkwood forests are over 1,000 years old. In order to have enough time to explore its wonders, you can stay overnight either at the Garden Lodge, the Forest Lodge or in private luxury villas. Each eco-friendly option is designed to complement the reserve's incredible natural beauty. Amenities range from tranquil swimming pools to organic 5-star dining.